Christopher Guest’s latest is the mockumentary Mascots, streaming on Netflix as of today. Following several mascots on their personal journeys as they compete and judge the World Mascot Association championships, the film takes a similar route as Best In Show. (Jennifer Coolidge even shows up as a trophy wife. Sadly she does not have much interaction with Jane Lynch’s character.) But the “mascottery,” as one character calls it, is unique and fascinating and ripe for original comedy. Mascot-ing may be a job, but the movie demonstrates that it can become a straight-up art form, even though the artist herself is hidden underneath a cartoonish outfit. As with previous Christopher Guest movies, this one didn’t have a script — just an outline with suggestions for scenes and and a few jokes that the ensemble uses to improvise most of the lines. This is a perfect scenario for Sarah Baker, a comedian best known for her role in Go On, playing a member of a grief counseling group who joined after her cat died. 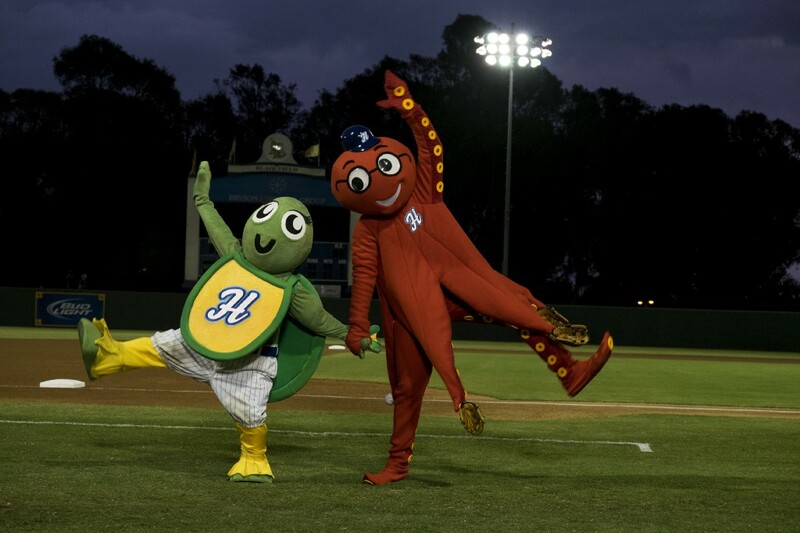 In Mascots, Baker’s masquerading as an animal, not mourning one — more specifically, she’s a mascot turtle named Tammy and one-half of a married couple who mascot together for a Kansas baseball team. 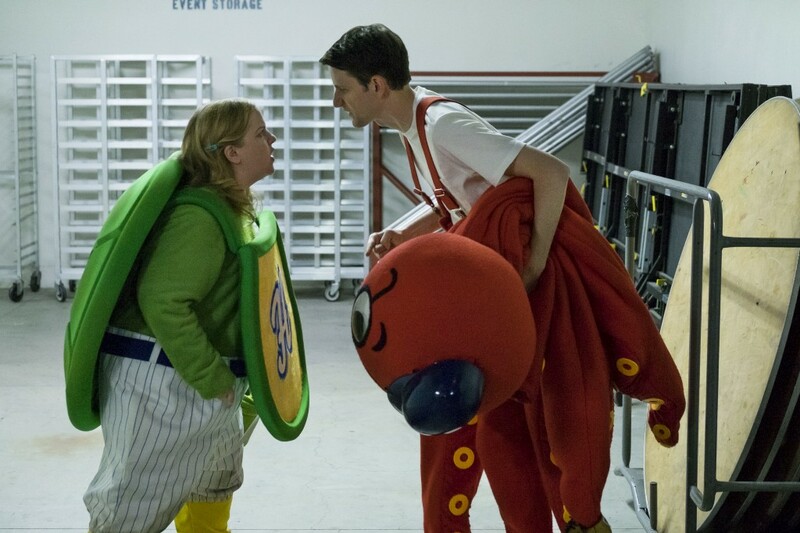 Silicon Valley star Zach Woods plays her other half, as Ollie the Octopus, and the cast is rounded out with Guest’s regular actors, including Parker Posey and Fred Willard. “If you love CG movies you’re going to be very happy with this,” says Baker, who caught up with MEL about the project last week. What was it like doing improv for the film? I come from an improv background. I used to work with a theater company called Whole World in Atlanta and I worked with the Groundlings in LA, so that’s a comfortable spot for me. I enjoy improvising and he really lets you sort of have free reign and then you, kind of, shape it as the scene goes on. What was it like playing off of Zach Woods? He’s amazing. He’s the best. He’s a wonderful human being but he’s also so incredibly funny, so quick, so smart. The kind of information he can come up with … I pretty much just had to sit there and react to him. I was doing pretty just to be able to do that. He’s obviously so funny, people know that but he’s also a really great person to have as a partner. I was very lucky. There was one scene between you two which is the most cringe-worthy things I’ve seen in a long time. The characters slowly lean into kiss, and then end up not kissing at all. Before that take I said to Zach, “I’m going to do something weird and physical in this. I don’t want to prepare you too much for it but I also don’t want you to be freaked out.” He said, “Okay! Do whatever you want,” so that’s what I did. Terrifying. It was. Although I was surprised at how attractive Zach Woods was. I was like, you’re Gabe from The Office. How are you a philanderer? He’s a very handsome guy. Don’t sell him short. Oh, no. He is! It’s funny because … I’m like, oh! Instead of the awkward office guy, you can play a philanderer now. Oh. Okay. I’m fine with this. Hey, you saw him in a whole new light. I got really lucky. I don’t normally do commercials but [associates of] David Rubin, the casting director…were working on a commercial and they said, “I know you don’t normally do commercials but this one Christopher Guest is directing. Would you be interested in coming to meet him?” I was like, “Yes, definitely he’s one of my idols,” so that was a year or so ago. Then I ended up doing that commercial and meeting CG that way, loved working with him and I was like, okay this is enough. Just to say that I got to work with him is incredible. And then, I don’t know if he was already working on Mascots at that point, but a few months later he called my rep and said, he’s working on a new project, that it’s going to be a film, and he’s writing a part for her in there. What were some of your favorite parts? Both stuff that you did and stuff you saw in the movie later. For me it’s hard to separate the experience from what’s in the movie, and I’ve only seen the movie once, actually. I’ve always been such a huge fan of Parker Posey so loved watching what she and Susan Yeagley did together — I loved that sister relationship and the dynamic and power shift that happens with that. I love Mike Hitchcock, he’s always so funny to me and he’s, as usual, really funny in this movie. Did you do your own stunts when your characters were mascotting? They had these incredible dancers, and this world-renowned choreographer, so we had dancers and stunt people doing all the mascotting. Which is lucky, because I don’t think it would have been very good if we did it. Yeah, I was like, I don’t know if that’s something that comes naturally to people. That would be a little bit scary. What are you excited to do possibly in the future? I love working with an ensemble so I’m always looking for projects like this and Go On. Shows that are populated with a lot of interesting, funny people. As for right now, I have an episode of Pamela Adlon’s new show Better Things coming up which I’m excited about just because I love her, and I think it’s a great show. I’m looking forward to seeing how Mascots does and then, you know, typical actress life. Who knows what’s next but I’m excited about the possibilities. What sort of stuff have you been watching lately that you’ve been enjoying? I love Project Runway. I’ve been watching … Stranger Things I watch. I thought that might be too scary for me but turns out was great. I’ve been watching Atlanta and Better Things. I think they’re both great shows and then I love Last Man on Earth. I love Bob’s Burgers. I love Brooklyn Nine Nine, that’s probably my favorite. Yeah, I love those shows. No, I like, would love you to be on one of those shows. Make some calls for me. [mimicking editor] No, I don’t actually. No! I was like, you will learn! Speaking of, what should we know about Sarah Baker? That you feel like not enough people know about you? Do you collect snow globes or something? Wow, that’s a good one. I don’t collect snow globes. I do have a weird amount of little carved animals. Owls and humming birds and turtles and stuff like that. I like little animals but I don’t know how weird that is, it’s just a thing about me. I don’t think it’s that weird. I think it’s pretty borderline normal actually. Sulagna Misra is a freelance writer in Los Angeles who has contributed to Vanity Fair, The Toast, Vulture, The Hairpin, The Billfold, Vice: MOTHERBOARD, and Teen Vogue.